Givemore Mudzinganyama was chased to the line, but was able to out dip Tranquil Gumbo to win the 2018 Sanlam Cape Town Marathon 22km PEACE Trail Run. Givemore Mudzinganyama was chased to the line, but was able to out dip Tranquil Gumbo to win the 2018 Sanlam Cape Town Marathon 22km PEACE Trail Run in near perfect conditions on Saturday 22 September 2018. Mudzinganyama was in two minds if he would be in the start line after having recovered from a bout of mumps in the week, but decided to chance his luck, a decision that certainly paid off. After sitting behind the early leaders, Siboniso Soldaka, Tranquil Gumbo and Jonathan Black, the 28-year-old took the lead for the first time as the runners went down the famous Packs Track towards The Glen as they approached the 8km mark. “I wasn’t sure if I was going to race today, so I relaxed on the early stages to see how things would go. I felt good just before the long climb (towards Kloof Nek) and decided to make my move,” said Mudzinganyama. And move he did, by the time he hit the 17km mark close to the historic Noon Day Gun, Mudzinganyama had a three minute gap over Tranquil Gumbo. Mudzinganyama kept a wary eye on Gumbo without over extending himself, but thought he had a bigger lead as he entered the home straight. Gumbo, unbeknownst to Mudzinganyama had closed the gap rapidly while Mudzinganyama thought he could relax coming into the home straight. Fortunately for the two time runner-up and 2015 winner, he caught a glimpse of the speeding Gumbo and put in a sprint to literally pip the hapless Gumbo on the line. The winning time 1:32.07 to 1:32.08 with Siboniso Soldaka rounding out the podium some six minutes adrift – 1:38.11. “I’m happy with my race after the last week when I did no training after my bout of mumps. I did feel a bit sluggish at times, but I can see I am getting back to top fitness again,” said Mudzinganyama. Bianca Tarboton had the proverbial flyer of a race. Taking the lead from the gun, Tarboton kept on forging ahead and ended with a winning margin of almost 5 minutes. Tarboton finished in 1:46.01. Marion Leiberich was comfortably second (1:50.52), with Cana Peek taking third (1:57.39). In a dominant display of front running, Admire Rushika defended his 12km PEACE Trail Run title with a comfortable margin of 5 minutes over Andre Afrika (50:09 to 55:29). Andrew Louw was third (56:59). 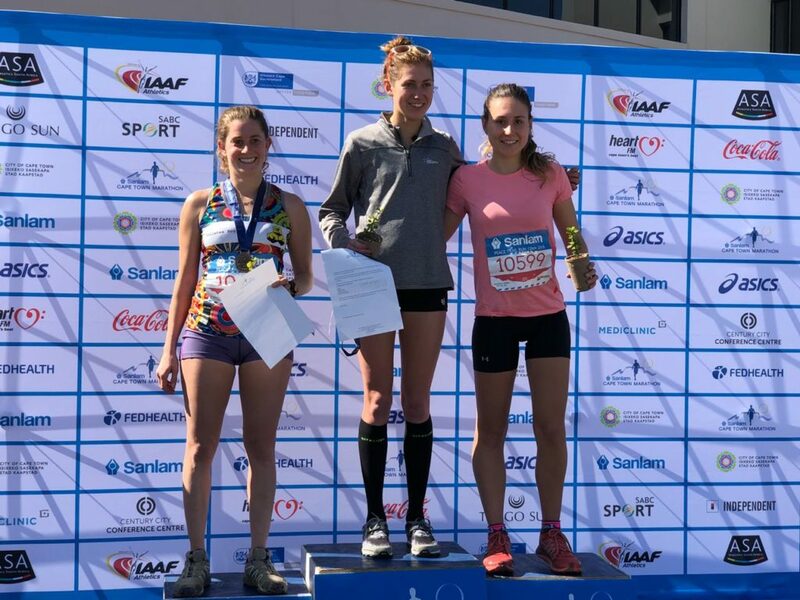 Leanda Du Bruyn ran away with the women’s 12km title, crossing the line in 1:03.22 to the 1:09.21 of Gianna Marais. Kyla Meyerson was third in 1:11.25.